Variations of potato pancakes are extremely popular in many parts of the world, including the United States. 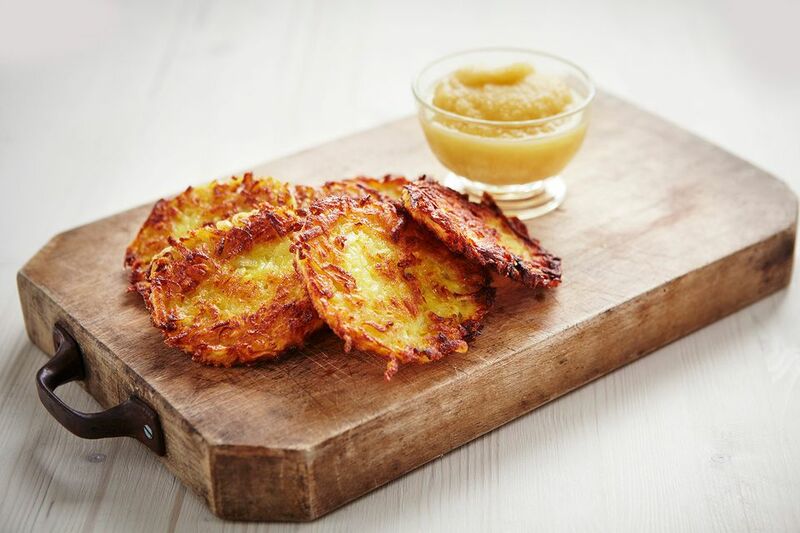 Now, you can make them at home with this simple recipe for German potato pancakes. Classic potato pancakes served with homemade applesauce or sour cream are pure comfort food, but you can use your own culinary creativity to amp up the flavor. Add some scallions or a tablespoon of your favorite seasonal chopped fresh herbs for a pop of freshness. Basil, sage, tarragon, thyme, or rosemary also would work well with this recipe. Another way to flavor potato pancakes is to add different spices to the batter instead of nutmeg. Add garlic powder, turmeric powder, ground sumac, chili powder, or chili flakes to taste for a great twist on this recipe. Alternatively, if you are considering serving sour cream as a side to potato pancakes, add the herbs and/or spices to the sour cream instead of the pancake batter. Dividing up the sour cream into two or three portions and flavoring each with a different herb or spice is a terrific way to have something for everyone. If you want to make a meal out of this recipe, just double or triple the ingredients. Golden, crispy fried German potato pancakes are a real treat and something Germans miss when they move away. Eating freshly made potato pancakes with applesauce at local outdoor weekly markets, Christmas markets, or during Karneval or Fasching are wonderful ways Germans normally indulge in this favorite traditional snack.